When I turned the page and saw this one it got me real excited - there are not too many West African albums that makes into the western conciousness. The title appearently translates to The Adventurers and it could very well be referring to the listeners cause it takes a little bit of bravery to leave all you've listened to as a western kid and delve into this recording of traditional Senegalese music fused with some more contemporary instruments. I don't understand a word of what Baaba and his griot Mansour are singing and sad to say I'm so stuck in the context of western popular music I can't really find the vocabulaty to describe the sound, but just to make it clear: it sounds good and has made me interested in listening to more. 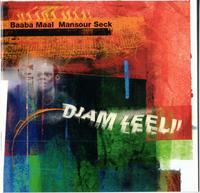 After some Interwebbing around I discovered that even now, 21 years from the albums major release and 26 years from when it was recorded for the Senegalese market, Baaba Maal is still active as a musician and activist and after at short review of all the causes he's involved in I think he deserves all the hype he can get. So check out http://www.baabamaal.tv/ for more info and songs from his latest album, Television, which seems to be an amalgamation of tradition and future. Definitely feels like worth the chance to check it out.